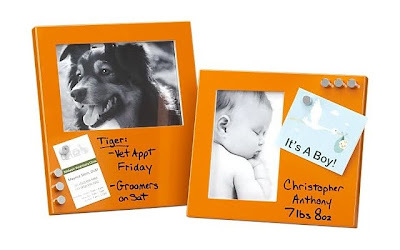 As someone who appreciates decor that is also functional, I love the idea of these Daffy Orange Photo Frames from Crate & Barrel. Although two of our three children are still too young to read, in the future, I would love to have five of these frames . . . one for each member of the family. Each steel frame comes with a dry erase marker and four magnets. They would look great displayed on a mantle, console table, or a shelf. Then we could leave notes and reminders for each member of the family. These frames come in two sizes . . . 4"x6" and 5"x7" and can be displayed both horizontally and vertically. Currently, they are only available in limited quantities online, but you can also check your local Crate & Barrel store. I wonder if I should pick up five of them and put them away for future use?